It’s a cat in a basket! I really hope Jimmie Chew doesn’t get sick of me drawing pictures from his blog, but I just love them. They crack me up. 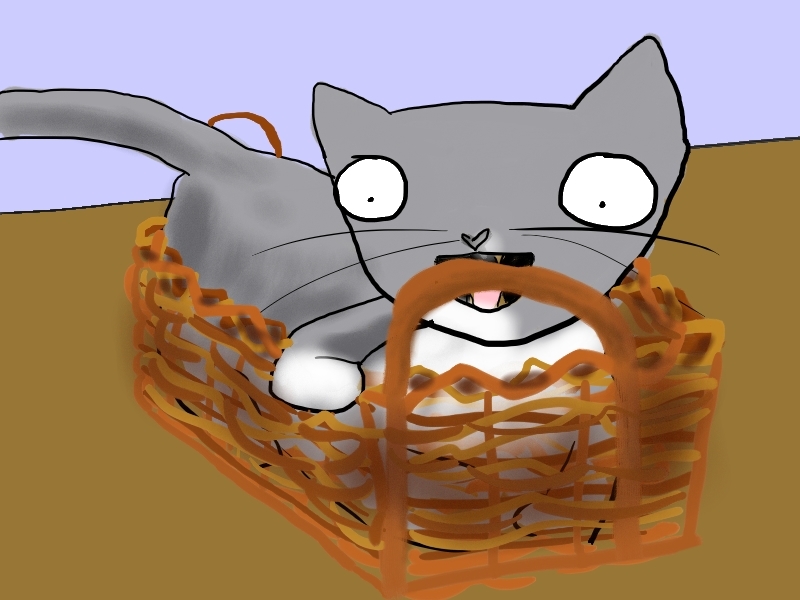 Here is a basket chewing cat cattoon. On another fun note, in just a few short days (10 maybe? I can’t recall) I will have posted a blog post everyday for the last year. Woo! So even though it’s 2012, this is the finale to my postaday2011. Thanks to everyone who follows along with me on my somewhat ridiculous cattooning adventures. “He’s got that annoying bird look.” – my brother. Jimmie Chew does have great photos. I love your rendition. If I didn’t get a cattoon everyday I would definitely miss it. AH! I’m sorry! 😦 I don’t know if I am going to keep doing it everyday, but I will for sure do it at least 3 times a week. I hope that isn’t too disappointing.